There is something rather special and slightly bonkers about Cartmel Racecourse, but that’s one of the reasons that many of our visitors come back year on year. As a privately owned, independent Racecourse we get to do certain things in our own style and that includes the keeping of some rather bizarre traditions. One of these traditions was initially assumed to be a joke by our recently appointed Managing Director, when we told him about the ‘blessing of the horse ceremony’ which takes place each August on the day in between the two race fixtures. Far from a joke, this much-enjoyed ceremony will take place on Sunday 26th August following on from the Sunday ‘steeplechase service’ in Cartmel Priory at 11:00am to give thanks for our wonderful sport. 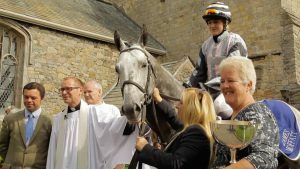 The service usually last for approximately 40 minutes, following which the Reverend Nick Devenish, Chaplain to the Racecourse, will say a short prayer of blessing outside the porch of the Priory in the presence of a thoroughbred racehorse, ridden down from local trainer James Moffatt’s Cartmel-based yard. In true celebratory style after the blessing on the driveway, the Racecourse team offer around glasses of prosecco. It is believed that the monks of Cartmel Priory were the first to instigate racing on the parkland at Cartmel from at least the middle of the fifteenth century, which is why the final meeting of the season is still annually celebrated with this unusual service in the Priory.